Ir. 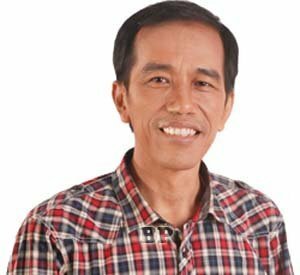 H. Joko Widodo (born in Surakarta, June 21, 1961, age 51 years), better known by his nicknames Jokowi, is the Governor of DKI Jakarta from October 15, 2012. He was the 17th governor who led the capital. Previously, Jokowi serving mayor of Surakarta (Solo) for two times the service period 2005-2015, but not resolved because elected governor of Jakarta. In his tenure in Solo, he represented F.X. Hadi Rudyatmo as deputy mayor. He nominated the Indonesian Democratic Party of Struggle. Joko Widodo born to Noto Mihardjo and Sujiatmi Notomiharjo. The hardship is experienced, he is forced to trade, mengojek umbrella, and so the porters to look for the school and for their own pocket money. When the other kids to school by bike, he chose to keep walking. Inheriting the trade of carpentry wood from his father, he began work sawed at the age of 12 years. The eviction that happened three times in childhood affects the way he thinks and his leadership after being mayor of Surakarta later when I had to curb residential areas. Held academic performance, he was accepted at the Department of Forestry, Faculty of Forestry, University of Gajah Mada. This opportunity is exploited to study the structure of the wood, utilization, and technology. After college, he worked in the state, but soon decided to leave and start a small business by pledging the house only, and eventually grow so brought him Micl Romaknan, which finally gives the popular call until now, Jokowi. With honesty and hard work, he gained the confidence and can get around Europe who opened his eyes. Setting a good city in Europe to be inspiration to be applied in Solo and inspired him to enter politics. He wants to demonstrate leadership and to realize human-friendly city for its inhabitants. With numerous experiences in youth, he developed a bad arrangement Solo and various public refusal to be disciplined. Under his leadership, Solo, and a study of changes in foreign universities /. Branding for the city of Solo performed by agreeing Solo slogan is "Solo: The Spirit of Java". Does progressive step enough for the size of the cities in Java: it is able to relocate the junk dealer in the Garden Banjarsari almost no turbulence to revitalize the function of open green land, provides qualified investors to want to think about the public interest, conduct regular direct and open communication (broadcast by local television) with the community. Balekambang Park, which displaced since abandoned by its administrators, maketh the park. Jokowi also did not hesitate to dismiss investor who does not agree with the principle of leadership. As a follow-up branding Surakarta he filed to become a member of the Organization of World Heritage Cities and accepted in 2006. The step continues with the success of Surakarta to host the organization's conference in October 2008. In 2007 Surakarta has also hosted the World Music Festival (FMD) which was held at Fort Vastenburg complex threatened to be evicted the business and shopping center. FMD in 2008 was held in the Palace complex Mangkunegaran. On June 11, 2004, Pakubuwono XII died without a chance to appoint the empress and crown prince, so there is a contradiction between his two sons, Sampeyan tradional Ingkang Sinuwun Kanjeng Majesty (SDISKS) Pakubowono Kanjeng XIII and Prince Gusti Haryo (KGPH) Panembahan Supreme Tedjowulan. For seven years there were two kings were appointed by both parties in the palace. This conflict eventually pushed the Indonesian government intervened by offering leadership dualism, with Pakubowono XIII as King and the Great Panembahan KGPH Tedjowulan as a representative or Mahapatih. The signing of the agreement is supported by four representatives of the minister, the Minister of Interior, Minister of Education and Culture, the Minister of Public Works and Minister of Tourism and Creative Economy. But the conflict has not been completed because of some royal families still refuse this union. The climax is the rejection of the King and Mahapatih to enter the palace on May 25, 2012. Both were intercepted at the main palace in Korikamandoengan. Jokowi finally reunite split this role after eight months to see one at a palace party involved in the conflict. On June 4, 2012 House Speaker Marzuki Alie finally declared an end to conflict Kraton Surakarta supported by statements by his willingness to take the Great Panembahan Tedjowulan, and readiness to reconcile the two families. 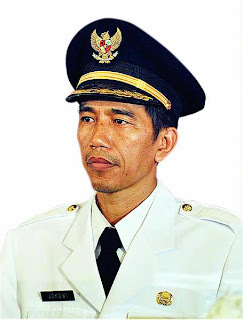 Jokowi requested personally by Jusuf Kalla to run for Governor of DKI Jakarta in Pilgub in 2012. Because it is a cadre of Democratic Party of Struggle, then Jusuf Kalla asked the support of Megawati, who was initially seen still in doubt. As a representative, T Basuki Purnama who was a member of Parliament nominated by moving to accompany Jokowi Gerindra because Golkar has agreed to support Alex Noerdin as Candidates for Governor. The couple initially not seeded. This is evident from the candidate claims petahana reinforced by the Indonesian Survey Circle that couples Fauzi Bowo and Nachrowi Ramli will win the election in a single round. In addition, the MCC who earned more than 42 percent of the vote in the elections for Adang Daradjatun 2007 also brings Hidayat Nur Wahid known people as the Chairman of the Constitutional Committee of the 2004-2009 period. Compared to the other party, PDIP and Gerindra only got each only 11 and 6 seats of the total 94 seats, compared to 32 seats for the Democratic Party's Fauzi Bowo, and 18 seats belong to the MCC for Hidayat Nur Wahid. However LP3ES already predicting that Jokowi and Fauzi Bowo will meet in round two. Quick count conducted a survey agencies on election day, July 11, 2012 and the day after that, showing Jokowi lead, with Fauzi Bowo in the second position. The couple turned underdog won election 2012 Jakarta because of the proximity Jokowi with Hidayat Nur Wahid as Mayor of Solo 2010 elections and supporting Faisal Basri and Alex Noerdin of the survey results tend to switch to him. Jokowi tried to call and visit all candidates, including Fauzi Bowo, but only managed to stay in touch with Hidayat Nur Wahid and led to speculation the coalition in the second round. Afterwards, Fauzi Bowo also met Hidayat Nur Wahid. But things turned around after parties supporting other candidates in the first round, even expressed support for Fauzi Bowo. Jokowi relationship with MCC is also worsened by the allegation that a successful team Jokowi raise the issue of political dowry Rp 50 billion. MCC requested this issue be stopped, while a successful team Jokowi assert exchange rate tersebut.Kondisi mention losing potential support from the major parties claimed Jokowi as the phenomenon of the "People's Coalition against Coalition Party".] This claim was denied by the Democratic Party because of the PDI-P and Gerindra remains a political party that supports Jokowi, unlike Faisal Basri and Hendrardji who are candidates independen.Jokowi finally got the support of important figures such as Misbakhun from the PKS, Jusuf Kalla from the Golkar Party, Indra J Piliang from the Golkar Party, and the Father Heri a sister-in-law Fauzi Bowo. Political battle is also venturing into the world of social media with the launch of Jasmev, the establishment of a media center, and the use of new media in political campaigns such as Youtube. Parties Fauzi Bowo also took to social media, but admitted excess campaign team and supporters Jokowi in this channel. The second round also saw a variety of alleged smear campaign, which among other issues ranging from the SARA, the issue of deliberate fires, corruption and transactional politics. Ahead of the second round, popping back surveys that predict victory Jokowi, including 36.74% against 29.47% by SSSG, 72.48% against 27.52% by the INES, 45.13% against 37.53% in the survey electability by IndoBarometer, 45.6% to 44.7% by the Indonesian Survey Institute. After the second round of voting, a quick tally Indonesia Survey Institute shows a couple Jokowi - Ahok as the winner with 53.81%. While its rival, Fauzi Bowo - Nachrowi Ramli got 46.19%. Similar results were also obtained by the Quick Count IndoBarometer 54.24% against 45.76%, and five television stations. estimates while the Quick Count method reinforced by Real Count PDI to yield 54.02% against 45.98%, Cyrus Network by 54 , 72% against 45.25%. And finally on 29 September 2012, the Election Commission set a pair Jokowi Jakarta - Ahok as governor and deputy governor of the new administration for the period 2012-2017 replaces Fauzi Bowo - Prijanto. After officially won the vote count, Jokowi still buffeted by issues blocking attempts by Parliament Surakarta resignation., But denied by the parliament. Home Minister Gamawan Fauzi also said it would step in if problems occur, for appointment as Governor of DKI Jakarta Jokowi not considered to violate any rules when registering as a candidate at the time the Governor had expressed readiness to resign from the post earlier if elected, and actually resigned after his election. But after that, the House plan amendment to Act No. 34 of 2004 so After Jokowi, regional head who ran in the other areas, must first resign from his post at the time to register as a candidate. Top reasons related administrative resignation as Mayor of Surakarta and tenure Fauzi Bowo who has not expired, the inauguration Jokowi delayed of schedule beginning October 7, 2012 to October 15, 2012. The event was marred debate about the cost because of the statement of wanting Jokowi sederhana.DPRD inauguration costs later down the cost of the inauguration to Rp 550 million, from U.S. $ 1.05 billion originally budgeted in ABPD Amendment. Inaugural event was also enlivened by vendors who eliminate wares. The day after the inauguration, Jokowi immediately scheduled a visit to the community. Subsequently, on October 24, 2012 ago, a demonstration at City Hall made a bunch of workers from the Confederation of All Indonesian Workers Union. . Initially the workers demanding higher minimum wage to Rp 2.79 million, which responded to an invitation by Basuki Tjahaja Purnama dialogue with labor representatives. Finally agreed to use the numbers Sufficiency Decent Living survey last month, from the previous averaged data from February 2012 to October 2012, as well as many other points to 13 deal. Jokowi then handed over to the proper calculation of UMP councils were initially led to recommendation number R1, 9Juta. But the trial is interrupted by labor actions that call back their representatives, so that the new figure represents the interests of employers. . It was agreed by all parties that the provincial minimum wage of Rp 2.2 million which was then set by the Wages Councils. Jokowi conduct consultations, including with the minister Muhaimin Iskandar, Governor of Banten and West Java Governor to determine the exact UMP for workers in Jakarta in order not to experience imbalances with a buffer zone, but still feasible to enjoy working. Determination of UMP by Jokowi still waiting for an agreement Employers and Workers, and the added reason "Waiting for a Good Day". So until 18 November 2012, the applicable UMP still amounted to USD 1.5 million.